Have you heard of quark? Nope, we're not talking subatomic particles here — we're talking superfoods. Though quark is widely available, it's not as trendy as, say Greek yogurt, so not everyone is familiar with the stuff. But you know what? It's well-worth getting to know. "Quark is a high protein, fat-free, fresh soft cheese that has a similar creamy texture to sour cream without all the fat and calories," explains nutritionist Janine Whiteson, MS. "While it draws similarities to cream cheese, cottage cheese and Greek yogurt, it's much healthier!" She notes that it's higher in protein and calcium and much lower in fat than cream cheese, lower in salt than cottage cheese and much lower in sugar than yogurt. It has twice the protein than Greek yogurt while also including the gut-friendly probiotics that yogurt does. "Quark is also a great source of vitamin K, which is essential to healthy living, but not talked about often enough — it helps keep calcium in the bones where it's needed and out of the blood vessels where it can cause stiffness." 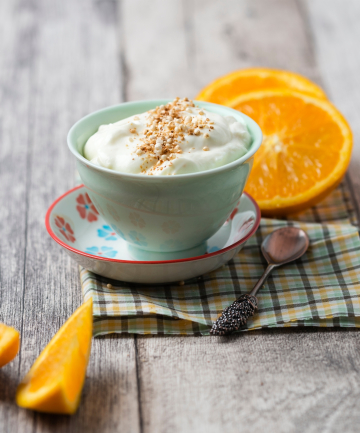 And in addition to all those benefits, quark is quite the versatile ingredient: "Being similar in texture to yogurt and cream cheese, quark can be mixed with fresh fruits, granola, nuts and honey, salads, spreads, dips and more and many recipes can substitute regular cheese or sour cream for quark," says Dr. Luiza Petre, a weight loss and management specialist and cardiologist. SEE NEXT PAGE: What type of quark should you try?